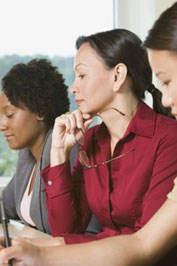 As one of the earliest divisions of the American Planning Association, the Women and Planning Division was formed in 1979 as a platform from which to transmit ideas and career concerns of particular interest to women and to the general membership of the American Planning Association. Promote the analysis and examination of the issues of women and planning at every level of government and in colleges and universities. We welcome your participation with over 300 other members in activities pertaining to women in the profession and the role of women in society as it pertains to planning. On this website you will find information about our division's activities and services. Please feel free to contact any of the division leaders with your suggestions and inquiries. Planners can foster more equitable, inclusive and livable communities with transportation, housing and zoning, and economic development policies that address the needs of women. This requires a shift in transportation planning from a focus on commuting to a focus on mobility. Planning and zoning codes should promote affordable housing, and neighborhoods should be designed intentionally to reduce care burdens and promote integration rather than separation of spheres of work and family (e.g. progressive zoning policies that allow broader definitions of family, accessory dwelling units, etc.). Finally, economic development policies should promote access to child- and elder- care, and homebased businesses. This project was conducted in collaboration with the Cornell Women's Planning Forum and the [Women and Planning] Division of the American Planning Association. Work was supported in part by an APA Divisions Council Grant. For more information see www.mildredwarner.org/planning/genderlens.